Marketing 101: You Don't Demand Employee Trust. You Earn It. At the same time, only 15% said that their company's culture was where it needed to be. At first glance, these numbers may appear to be somewhat at odds with one another - but they really aren't. Corporate culture begins at the top and, if anything, that 15% statistic can be attributed to one essential little word: trust. Leaders set the tone that affects the entire organization, and if employees don't trust their leaders, they ultimately don't trust the direction of the business that they're devoting so much of their lives to. 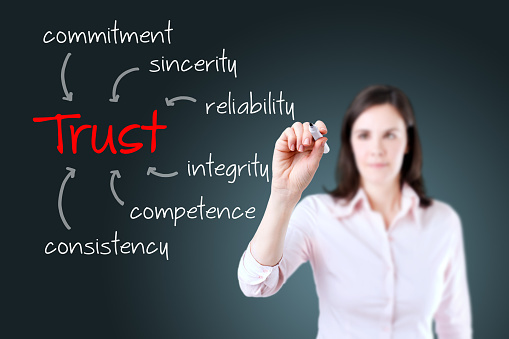 Make no mistake: trust is not something that you can demand from your employees. It's something that you have to earn - all day, every day. It's also something that requires you to keep a few key things in mind. Yes, you worked incredibly hard to become the leader that you are today. You put in long hours. You worked weekends. You devoted the majority of your life to your career and a constant push to achieve bigger and better things for yourself. Now you're in charge of the proverbial ship, and everyone should just trust that you know what you're doing by default, right? There's an old rule of storytelling that says that whenever possible, "show, don't tell." That essentially means that instead of having a character talk about some important development in the plot, SHOW the development instead by having them do something active. It's why in "Star Wars," instead of just having people stand around and talk about how bad the Death Star is, we see it blow up a planet to convey the same information in a much more active way. This is the same mentality you need to adopt if you want to start earning the trust of your employees. If you make a mistake, don't shift the blame - accept responsibility. Don't ask any employee to do anything that you would be unwilling to do yourself. If you want people to come in on the weekend, you should also come in on the weekend. If you need your team to work long hours, guess what - you need to work them, too. Every day, look for new opportunities to show your employees that you not only value what they do but that you're all in this together. Remember that their productivity, hard work, and excellent performance needs to benefit more than just you and your career - it needs to positively impact them, too. They're not going to follow you into battle because you tell them to. They have to want to do so. The only way you can get to that point is if they trust you, and the only way you can get to THAT point is if you're someone worth trusting. This simple distinction is often what separates a good leader from a great one.